Thanks to the Cabbige acquisition, farmhand® users will have full seed-to-sale tools. We're incredibly excited to announce our acquisition of Cabbige! Freight Farms and Cabbige both have roots in the Boston AgTech scene. CEOs Brad McNamara (Freight Farms) and Jessica Angell (Cabbige) have always shared the goal of creating a more distributed, sustainable food system. Cabbige is an online business management application designed for small-scale farmers. Farmers manage some of the most complex businesses imaginable: dozens of products, multiple channel types, and unpredictable and perishable inventory. At the same time, these businesses fill a crucial need by providing fresh and nourishing food for local communities. With Cabbige, small-scale farmers can easily and confidently make data-driven decisions to improve the profitability of their business. A proprietary pricing tool helps farmers determine the most profitable price for their crops throughout the season. The reporting suite delivers easy-to-understand insight into business trends. The inventory management tool automatically factors in a product's perishability. Today, farmhand® allows growers to control and monitor their operations with IoT technology. The farmhand® platform also provides integrated tracking, analysis, and shopping features. Combined with Cabbige’s software, farmhand® will provide users with all the tools needed to run their farms and businesses from a single application. 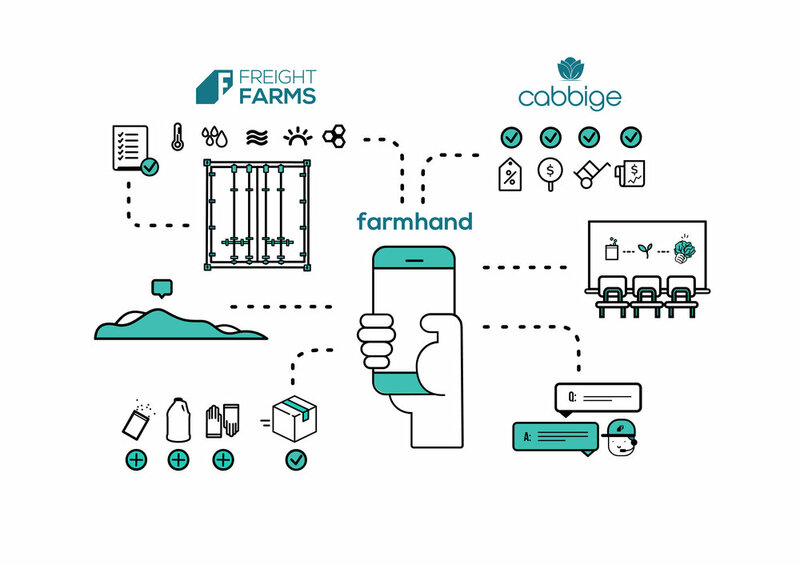 With the integration of Cabbige’s business technology, Freight Farms plans to release a paid version of farmhand® to a broader farming audience in 2018. Let's hear from the CEOs! “Brad and I came to realize that our two technologies would do more for small business farmers together than separately. With this acquisition, Cabbige will be able to expand its impact to indoor growers and to give small-scale farmers an end-to-end solution for growing and selling fresh, local produce." Please contact us at growfoodhere@freightfarms.com for any media requests.